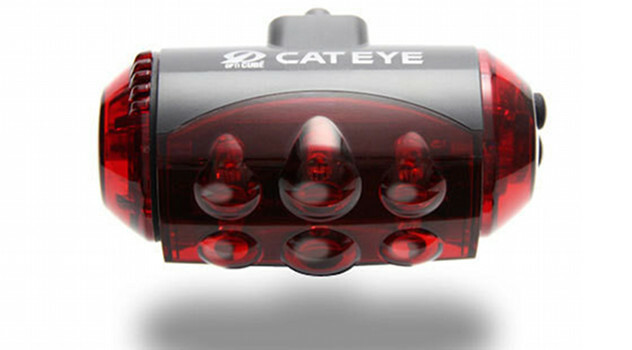 The Cateye TL-LD1100 is the brand’s top-of-range rear LED light. It makes use of a whopping ten LEDs (some rear, some side-facing) and takes full-fat AA batteries to give outstanding runtimes. Currently Chain-Reaction are doing 14% off while Wiggle have it on a 10% discount. As it’s quite a costly option, the TL-LD1100 has stayed on as a backup light for longer than you might expect, and before that served as primary light for a year on our shared 12 mile commute. The Cateye TL-LD1100 is not a clip-on style light – you must use one of the Cateye mounts (although you can get hold of a belt clip adapter mount if you want to use it this way). The TL-LD1100 does not come with Cateye’s newer flex tight brackets – probably because it’s just too heavy. You will need to keep coming back to check your mount as there have been numerous reports of lights dropping off. Ours uses the rack mount adapter, working around this problem. The physical size of the TL-LD1100 may seem intimidating but in fairness it is fat in every dimension, so at least you avoid the difficulties presented by the TL-LD600 strip light. The Cateye TL-LD1100 has two buttons and a total of 24 modes – four modes per button, the buttons being independent in operation. The side-facing LEDs are a nice touch. While there are limited situations in which a driver is likely to be targeted by them, it’s certainly reassuring to know that you’re spraying red light in every direction! One of the biggest annoyances with this light is that if you just want all the LEDs to flash, each “half” of the TL-LD1100 operates at a slightly different speed, so it slowly changes from all flashing at the same time to perfect counterpoint (i.e. effectively non-flashing at half-strength) and then back again. This will drive you mad if you’re riding behind! The LEDs are not ‘power LEDs’ (as found on, say, the Smart Superflash and similar lights). However, there are so many of them that, combined with the use of full-size AA batteries, the Cateye TL-LD1100 remains a very bright light indeed. Depending on the mode you use, the TL-LD1100 is a borderline mega dazzler. Making it unpleasant for people to drive behind can definitely encourage them into a rushed overtake. It’s not as bad as many of its competitors, however. The TL-LD1100 does allow you to run only half the light at a time, reducing glare (although then, why aren’t you just running a cheaper light?). It’s important to mount the light completely level, as designers depend on this when working out off-angle visibility and other factors. Do not point it at the ground by mounting vertically on the seatpost! Because the Cateye TL-LD1100 hasn’t passed the relevant tests it isn’t road legal when used on its own (in any mode). The Cateye TL-LD1100 has two small rubber buttons to one side of the case. You have to count many different presses to take the light from ‘off’ to your chosen modes, and a different number of presses to turn it off again. I actually found this surprisingly frustrating! Unlike a great many of its rivals, the Cateye TL-LD1100 runs on two full-size AA batteries. This gives it fantastic battery life despite the large number of LEDs – 50 hours steady and 100 hours flashing. Remember that the temperature at which you use the light and the type of battery used both influence that figure. This is actually more than the real wattage of both the RSP Astrum and Smart Lunar R2 lights! The Cateye TL-LD1100 has solid weather sealing (based on all weather mileage), but I have had repeated trouble with the little rubber buttons on the end being dislodged if brushed across the light (say in a pocket or bag, or just a badly-aimed finger). Trying to get the rubber bit back in to re-seal the button is an exercise in exquisite frustration! As with all lights, mounting under the seat (combined with a mudguard) virtually guarantees trouble-free operation. The Cateye TL-LD1100 rear LED light is a comparative giant – both in size, weight, long runtime and cost. It is not outrageously bright, especially if you moderate the modes – which is a great advantage if you are a social rider and especially if you don’t subscribe to the simplistic “more watts = more safety” bandwagon. It is reliable but operation can be frustrating due to the millions of different modes, and the fact that each half of the light seems to run to a different rhythm. The apparent dodgyness of the seatpost mount is a worry. At twice the price of many rivals, this is not a light you would be happy to lose. Again, Chain-Reaction are doing 14% off while Wiggle currently have it on a 10% discount. Hi. I would imagine all lights on would be useful for fog or when on A roads (where cars are unlikely to stop behind you but come up very fast so the sooner they see you the better). How does this compare in brightness to the Smart Lunar R1 (I have just bought one without clips for £6). My old smart clips work fine with it! I heard that the “new” 1/2 watt and 1 watt bulbs are more efficient than the older super bright LEDS. I would love to know how this compares in brightness to me Smart Lunar R1 1 watt. Another place where I would want full on brightness would be when cycling into the sun. I did this recently on a B road and was in fear of cars behind not seeing me. And maybe around dusk where the ambient light would not make it appear so bright (drivers’ pupils will adjust). This is a bigger light so it’s easier for drivers to judge distance than it is to the point source of an R1. However, to be honest I’m quite happy punting around with an R1 because it’s light, simple and has adequate battery life. Having to press two buttons half a dozen times to get the light to switch off is a real drag with the LD1100 if you’re doing it several times a day! I have used this light for a few years and its great. But you only have to hold the buttons in for a couple of seconds to switch the light off ie you dont have to keep pressing the buttons as you have stated. Enjoy your reviews – keep up the good work!